The present book is a statistic course for undergraduate students in all fields of social and economic sciences. The book presents a manual on a course "General Theory of Statistics", including a series of not quite traditional topics. Above all, it concerns the mathematical bases of statistics and use of computer technologies in statistic probing. At that, thematic choice of the chapters and sections of the book is caused not only by interests and tastes of the authors, but also by modern tendencies in applied statistics and orientation of the given work. 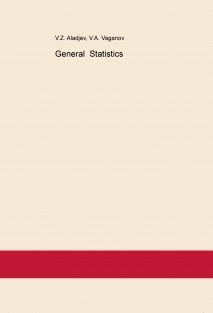 The book contains a series of concrete proposals for improvement of statistic practice; many of them are based on our experience in practical statistical activity in statistical organs of USSR and Estonia in the early nineties of the last century. A comparability aspect of the Soviet statistic school inheriting many traditions of the worldwide known Russian school of the probability theory and statistics, with western statistics can be a rather interesting to the Englishspeaking reader in historical and substantial respect.